Tens of thousands of people have been stranded across the Alps after 'once-in-a-generation' weather dumped almost 2 meters of snow on some ski resorts in less than 48 hours. Schools and nurseries in have been closed and roads cut off after the Savoie department in France was placed on red alert - the highest warning for avalanches. Tignes and Val d'Isere have been in lockdown with tourists and residents confined to the area. Météo France, the weather forecaster, said that similar conditions had occurred only once in 30 years. Preventative releases of avalanches will be set in motion as soon as the helicopters can take off, local authorities have said. "We really recommend that people stay at home, the avalanche risk is high, these are conditions that we've not seen since 1978." said Captain Hélène Delas, a fire fighter in Savoie Department. 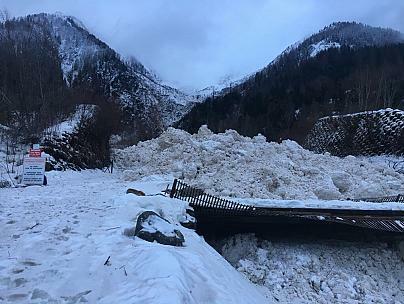 Devastation was narrowly avoided this morning in Chamonix when a huge avalanche swept down a mountainside near Les Houches hitting 40 chalets, although barriers took the brunt of the impact. 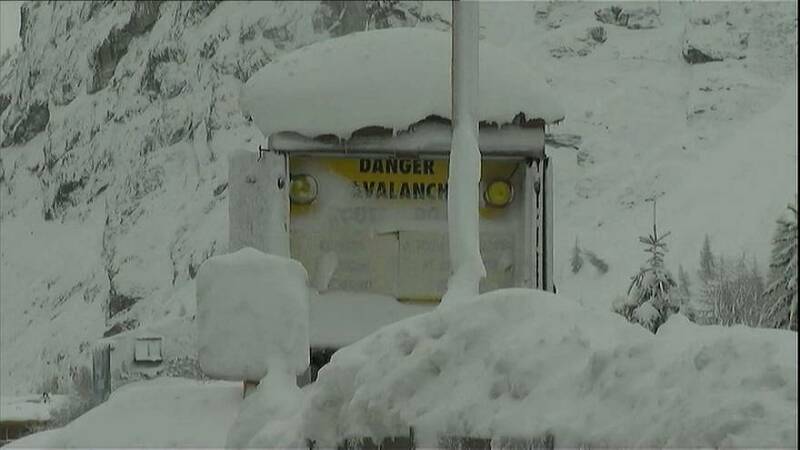 In resorts across the Alps blasting using powerful explosives has done little to lower the avalanche threat as snow keeps falling. An estimated 10,000 tourists were stranded in Italy. The road to the famed Aosta ski resort of Cervinia was closed due to avalanche risk, making the road from Valtournenche to Cervinia the only way to get to the famed resort. Gressoney, also in the Aosta Valley is isolated due to unceasing snowfalls and the small ski town of Cogne was cut off after an avalanche swept across the access road. In Sestriere an avalanche engulfed two floors of a hotel overnight, smashing windows and filling corridors with snowy rubble. 69 people were evacuated, but no one was injured. In Switzerland, the first men's World Cup downhill training run in Wengen was also cancelled. Snow and winds of up to 200kph meant there was significant damage to the course.